the annual river draining. This year's draining will take place Jan. 2 through 9. 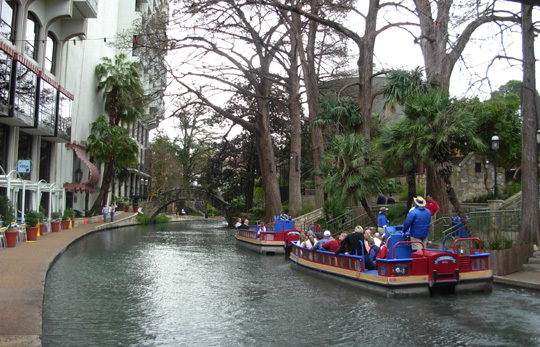 And only in San Antonio could a river draining be an excuse to party!" Well, phooey. We missed the river draining and Mud Festival! Just kidding. 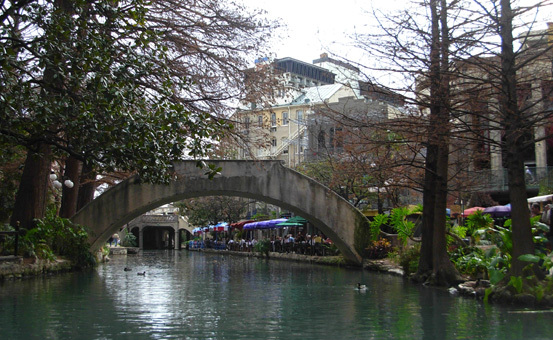 We saw this very beautiful U-shaped (or "horseshoe") section of the San Antonio River at "full pond" and it is magnificent indeed what the city has done to draw folks to its downtown area. 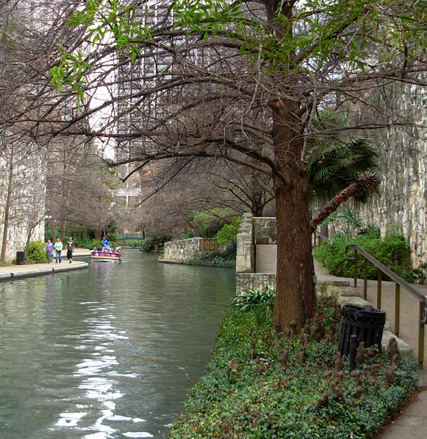 I wish Roanoke would do something like this with the unruly river that flows through the city; we do have a nice greenway along six miles of it, so I suppose I should be happy with that. 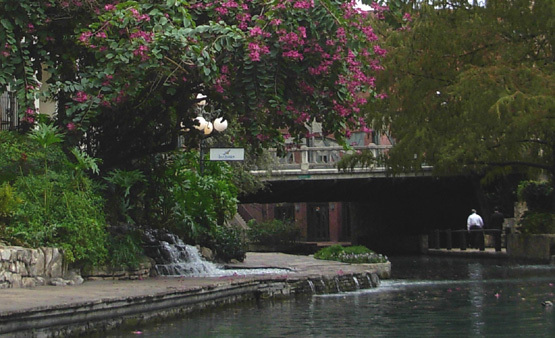 After reading about River Walk and seeing photos of the lush tropical foliage and interesting shops along its 2�-mile length, the attraction was on my list of Definite Things To Do in San Antonio. The concept is very cool. The city "turned its lemon into lemonade." 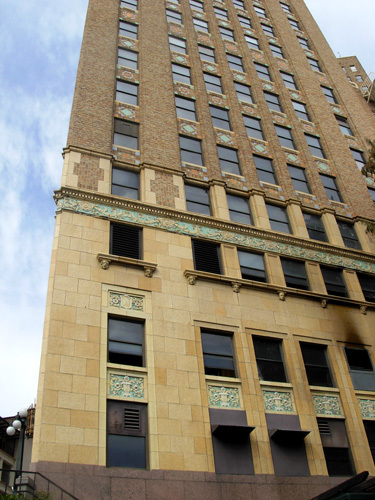 A major problem became one of San Antonio's major assets. 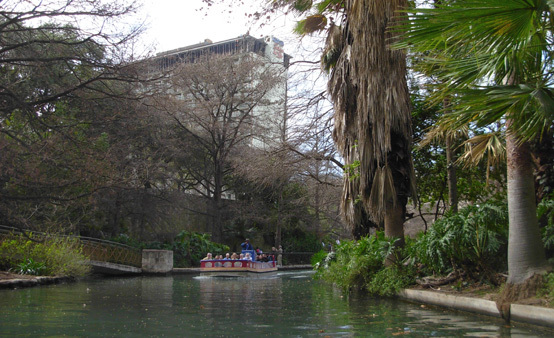 As rivers are wont to do, the San Antonio River used to flood parts of the city. In 1921 a major overflow wreaked havoc, killing fifty people and causing millions of dollars in damage. It took some time and a bunch of money to come up with the brilliant solution of digging a U-shaped bypass channel, constructing two dams, putting in beautiful landscape features, building interesting shops, hotels, and restaurants along the channel, and adding a meandering footpath . . .
. . . but when they were finally done, the city had a gorgeous shopping district in a park-like setting that is a real treasure. 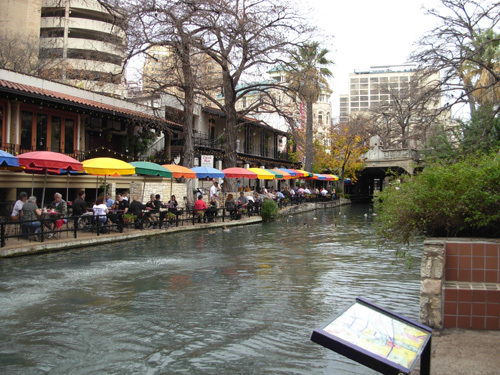 And it's right smack-dab in downtown San Antonio, drawing people like a magnet. The water in the dammed River Walk section is not very deep. I think our riverboat captain said the water is only about three feet deep, which is good in case a tourist falls in! The flow is not as fast as in the main channel, either, and gunk settles on the bottom. So do other interesting items, reportedly. 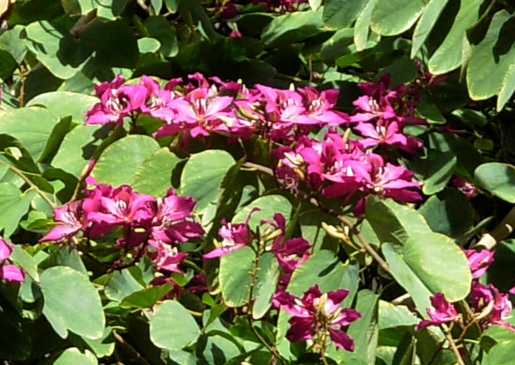 They don't want that to accumulate and become unsightly. In addition to continual clean-up efforts (we could see some of that work being done), a unique dam-and-door system is used to drain the River Walk portion of the river the first week of every January. What's left is MUD. And this enterprising city has found a way to turn THAT "lemon" into "lemonade," too: the Mud Festival. 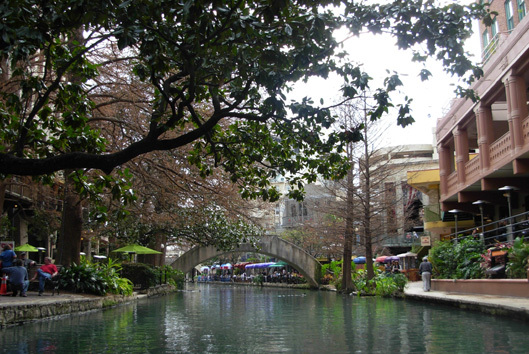 (San Antonio has lots of festivals.) 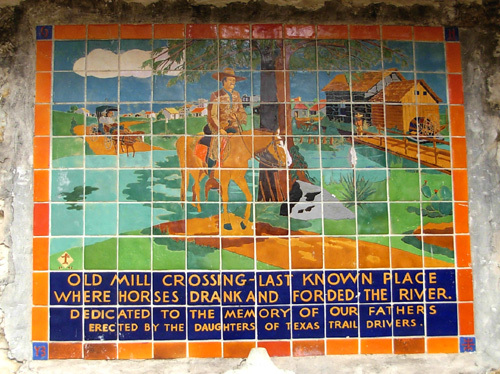 There is an arts and crafts show, Mud Pie Ball, Mud Parade, and crowning of a Mud King and Queen, titles bestowed upon the man and woman who raise the most money for the River Walk Association. 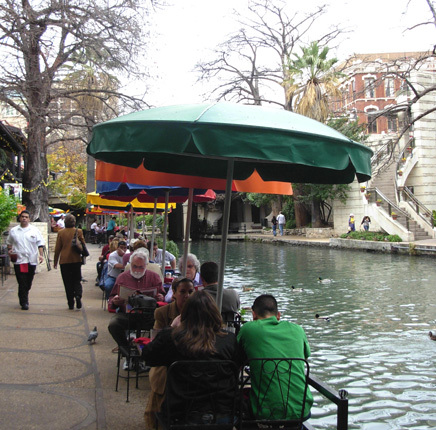 We were able to find a parking spot at Alamo and Market streets, less than a block from the entrance to River Walk that faces Casa Rio, the first restaurant built along the river. (Before we left we ate lunch at one of those tables in the photo below.) 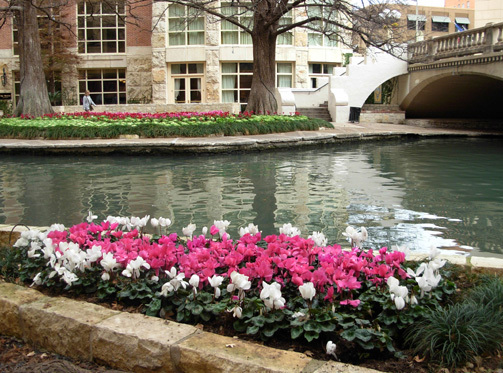 We put two hours' worth of coins in the meter and could have spent much more time than that along the River Walk. We descended the stairs to the river and followed the tree-lined path clockwise around the southern and western part of the U-shaped route to the main channel of the river, climbed up to a street to the other side, went back down to river level, and walked back toward Casa Rio the same way we'd come, but on the other side of the river. This was less than half the total distance of the "horseshoe." I was surprised how many people were there on a weekday morning in January! I'm guessing it's very busy on weekends, especially in warmer months. Keep that in mind if you plan a visit here. With all the hotels, this also appears to be a major convention and/or tourist center. 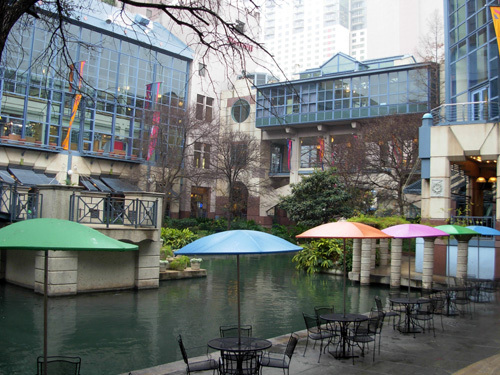 Casa Rio Mexican Restaurant, the first establishment built along River Walk. The proprietors used to run a gondola service from here, too. 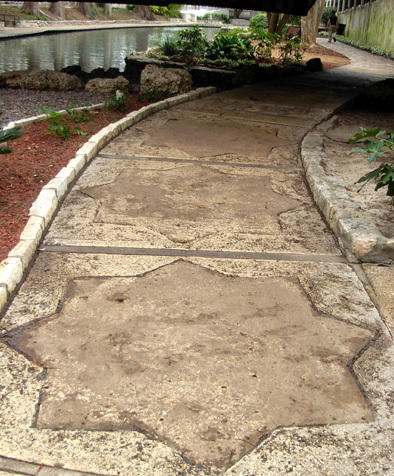 I was captivated by the interesting shops, restaurants, and hotels at water's edge, the colorful landscaping with lots of shrubs and flowers, the huge old cypress and cottonwood trees, the romantic arched bridges that allow visitors to go from one side of the river to the other, even the designs in the pavement (like the stars, below). There is a lot to see and many places to stop. 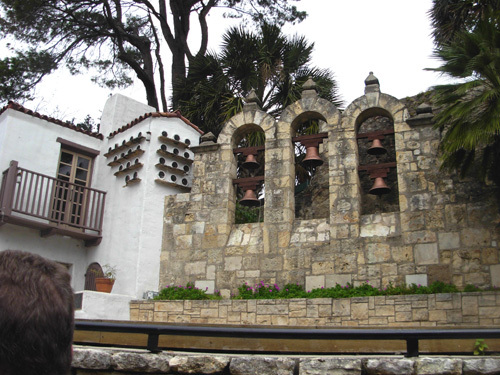 Mexican folk dances, opera, flamenco, and other musical events are performed here in the summer. Passing riverboats add to the ambience during the shows. 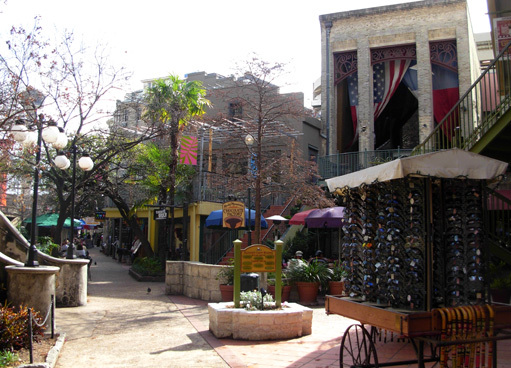 Also up the steps to the left (two photos up) is a unique shopping area called La Villita. 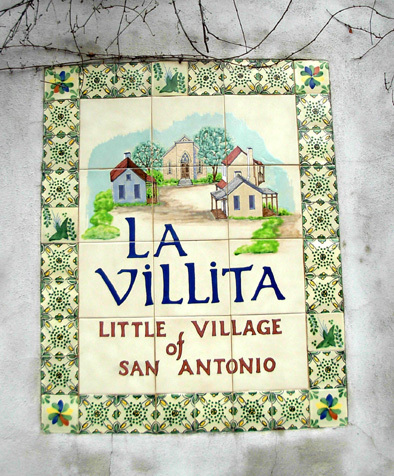 We saw this attractive tile sign for La Villita in the marble wall along River Walk but didn't take time to go up to see any of the shops. We're not real big on shopping. I'd probably enjoy seeing the architecture in La Villita, however, so it's on my list of Things to Do Next Time. 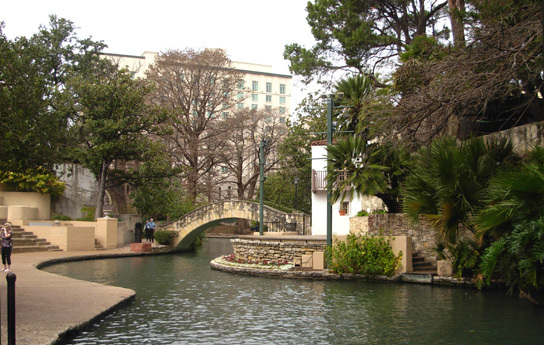 It's the oldest residential area in San Antonio. Its adobe buildings have been restored and converted into art galleries and shops. There is also a museum of early American culture. While we were walking we could hear the various flat-boat river guides talking about the history of this building and that, and decided it would be nice to take a boat tour so we could learn more about what we were seeing. 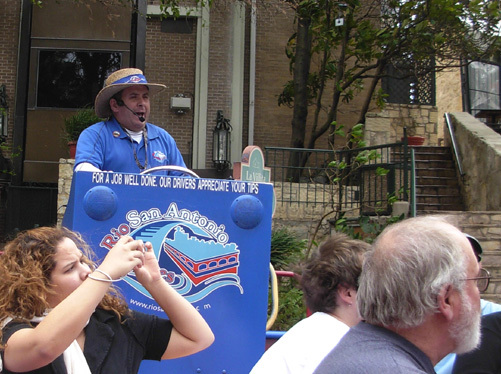 Not only was our boat tour educational, but the entertainment value alone was worth the cost of the tickets! Our guide (below) was pretty comical and worked hard for his tips. He probably gets tired of the same stand-up routine umpteen times a day, but it was new to us and the other passengers. We paid $5 each for tickets for the 30-minute tour. That is the military or over-60 price. Regular fare is $7.75. What's ironic is that the woman in the ticket booth was the ONLY person on this trip who noticed that my military ID card had expired a few weeks ago -- not the eagle-eyes at White Sands Missile Range, nor the easy-going guards at Fort Sam who checked us in once or twice a day for over a week. I had to dicker with the ticket lady for a while to get my discount, but she finally saw it my way. We thoroughly enjoyed the boat ride and recommend it to others. Our guide pointed out things we'd either missed on our walk or didn't know the relevance or history of what we'd seen. 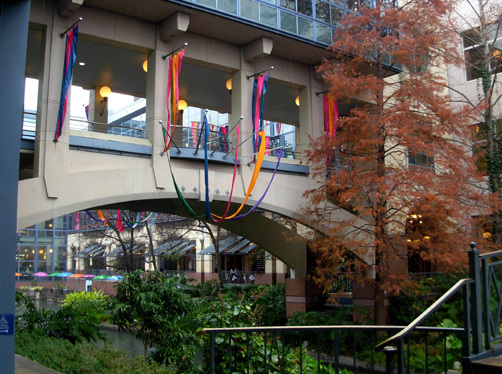 For example, he showed us a spot along the river where many couples get married. He showed us where the doors drop to close off the main river when the shallow channels are drained, stopping the boat right under the location where the guillotine-like doors drop down. In the next entry I'll have a close-up of the decorative tiles and paintings on the fa�ade above. We had time after the tour to walk most of the rest of the way so we could get some ice cream, take more photos (see duck below), and see some things more closely (like the 300-year-old cypress tree the guide pointed out -- it's amazing how many huge, old trees are still alive in this city). Intrigued, we went down to water level and walked around just a bit in a light drizzle before going back inside for the movie. 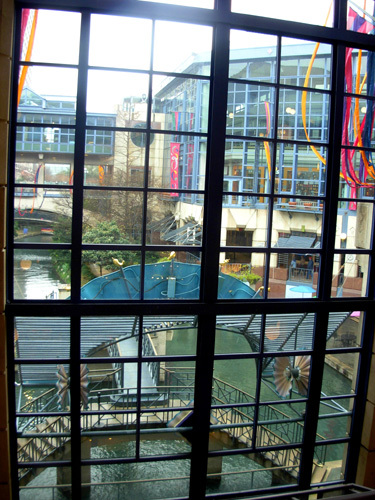 Seeing that little part of River Walk made me eager to see the rest of it but I was happy to wait for a dry day for a longer walk..
We dislike shopping in general and malls in particular, but Rivercenter is pretty cool. We ended up seeing two movies that day (the second one was free because of minor technical difficulties with the first show) and returned for a third movie at half-price on another day. Parking is free with a validated IMAX ticket. 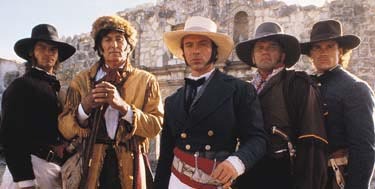 The movie we saw first was "Alamo . . . the Price of Freedom." It was good to view that before we toured the Alamo a few days later (the 18th-century Alamo is only a block from the thoroughly modern, gleaming Rivercenter complex). For our free IMAX movie, we chose "Lewis and Clark: Great Journey West," which was also interesting The half-price show we saw on another day was "Deep Sea 3-D." It was fun to try to "catch" the fish in front of our noses! We rarely go to regular movie houses because of the hassle, noisy people, and cost, so this was a real treat for us. The theatre was virtually empty on the weekdays we attended, we saw three shows for very little money, and huge IMAX screens are always magnificent (this one is six stories high). For folks who purposely live in a rural area and love to run and camp in remote forests and mountains, we sure do enjoy visiting cities on occasion! Not just any city, though. We have our own varied criteria (history, scenery, architecture, fun things to do, ethnic restaurants, reasonable costs, ease of driving around, etc.). YMMV. San Antonio isn't quite up there (on our list) with cities like San Francisco and Washington, DC, for example, but we've really been enjoying it. 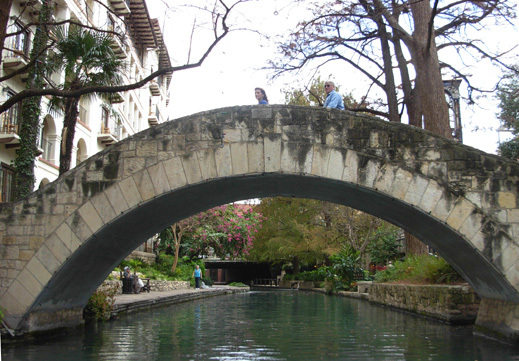 I've only begun to describe what we've seen here -- there will be four more entries about San Antonio, and that's just scratching the surface of what you can do and see here. 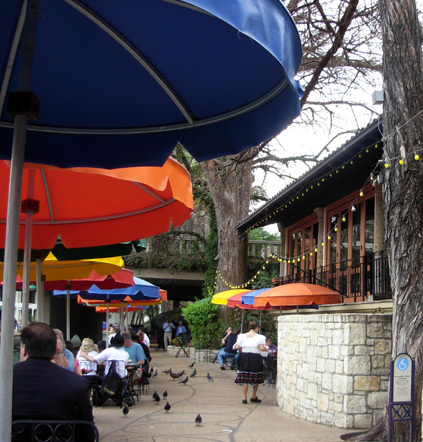 We think this is a good time to visit -- in the winter months when it is cooler (60s and 70s) and not real crowded. Numerous special cultural and sporting events are scheduled throughout the year, however. 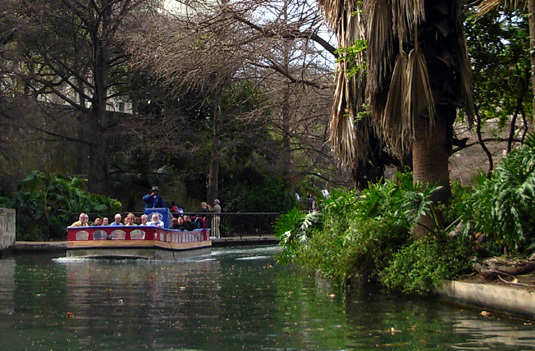 There are many ways to tour the city's famous attractions and historic residential areas. We chose to either drive or walk to see most things, but there are also water taxis, riverboat cruises, city buses, Gray Lines tour buses, and trolleys. 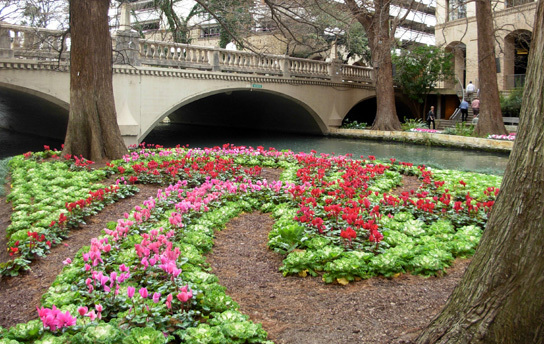 Several companies offer narrated tours of downtown, the Mission Trail, and residential areas, as well as attractions beyond the city such as the scenic hill country, Fredericksburg, and the LBJ Ranch. These guys quack me up! There were even more on the ledge but they won't all fit on this page. 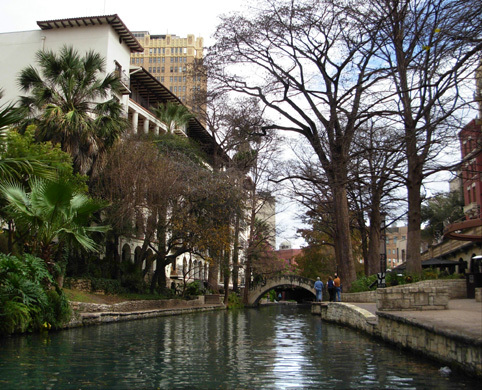 If you visit San Antonio remember that the downtown street system was laid out more than 150 years ago. Sometimes it follows old cattle trails and has been likened to a "skillet of snakes." Reminds me of Atlanta! At least in San Antonio, every other street isn't named "Houston" like Atlanta's ubiquitous "Peachtree" nomenclature. We did fine simply following the maps we had and the ones we acquired free at various locations.